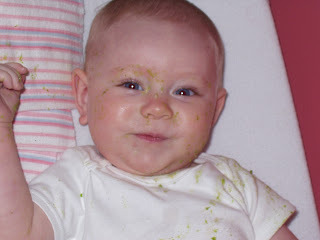 Why is it that all parents take pictures of their kids when they are all covered in food?! Before I was a parent I thought I would never take a picture of my baby when they were all covered in food thinking that I'd only want to have lasting memories of a clean baby! But, with both kids I haven't been able to resist to capture that cute, albeit messy, moment on camera after they have truly enjoyed a good food! Just can't be more proud of himself here! J is 10 months old and loves to stand up and is starting to cruise around a bit, too. He holds onto the furniture or the fingers of a person who would rather help a smiling boy learn to walk even though it means they'll end up with a backache!